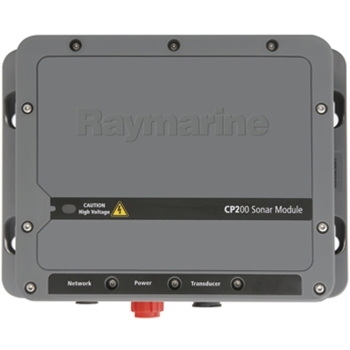 Raymarine’s CP200 CHIRP SideVision Sonar provides up to 600 feet of side to side underwater coverage. See fish and structure with exceptional clarity well beyond the sides of your boat with CHIRP side scanning. CPT-200 Transom Mount Transducer included. Broadening the horizon for fishfinders, the Raymarine CP200 Chirp SideVision Sonar module brings fish finding to a whole new level. Chirp processing will provide you with the best detail and clearest images of either side of the boat. Up to 600ft of viewing distance on either side of the boat, you will be able to view photo like images of bottom structure and man-made objects. Manual adjustments are also possible with the CP200 so you get the best clarity in any situation. There are low angle settings for deep water use, and high angle settings for shallow water use. Compatible with A-Series, C-Series, E-Series, eS-Series and gS-Series units running a software version of 10 or later, connectivity is easier than ever, and the CP200 is virtually ready to use right out of the box. If you already have a digital, chirp, or chirp downvision sonar, the CP200 will work alongside with those giving you the clearest and most defined images of below and on either side of your boat helping you target those big fish! Delivering power and performance, the Raymarine CP200 Chirp SideVision Sonar is a must have for the serious fisherman! The Raymarine CP100 Sonar Module with CHIRP DownVision technology takes the guess work out of determining exactly what you’re seeing beneath the boat by allowing you run and view both traditional and CHIRP DownVision technologies simultaneously.